Last year, when I saw the announcement that a new tabletop radio–the Alinco DX-R8T–was about to hit the market, I almost fell out of my chair. A new tabletop on the market? Could it be true? Over the past few years, many long-time manufacturers have dropped out of the shortwave tabletop market, while newer, smaller manufacturers have been popping up in the SDR (Software Defined Radio) market. SDRs are great–a lot of performance for the price–but to listen to the radio, you have to turn on your computer, launch a program, and typically, do things to isolate any noise your computer may generate. A tabletop, on the other hand, simply requires that you turn it on: instantly, it’s there, awaiting tuning. Obviously, I was eager to try out the DX-R8T. Fortunately, the good folks at GRE America (the US distributor for Alinco) kindly loaned me one of their receivers to review for SWLing.com. The face plate on the Alinco DX-R8T is detachable (with optional extension cable). 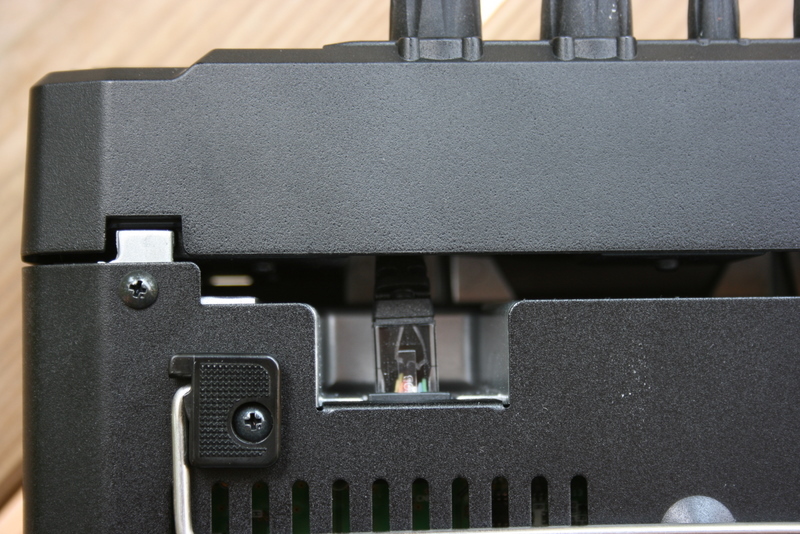 This view, from underneath, shows where it plugs into the receiver body. I really appreciate the size and feel of the Alinco DX-R8T. It’s heavy, with a metal case and a very durable plastic face plate. It has a bail under the front panel which allows it to be lifted and carried for easy tabletop operation. Please note: If you’re new to tabletop shortwave receivers or ham radio transceivers, be aware that the Alinco DX-R8T is based on the Alinco DX-SR8T ham radio transceiver–and as such, it operates on 12VDC. Meaning, you will need a 12 volt power supply like the Pyramid PS-3 or similar. If you already have a power supply, make sure it can at least deliver 1.5 amps at 13.8V. You do not want to purchase a “wall wart” type power supply, as many of these are noisy and will effect your ability to hear stations. For the purpose of review, I have actually been running the DX-R8T off of a 40AH, 12 V battery to eliminate all such noise. The tuning knob on the DX-R8T is solid, smooth and certainly pleased this reviewer. The tuning knob, which I personally find to be a particularly important feature, is substantial, solid, and moves fluidly–a plus. I have not found a way to adjust the tension/resistance on the tuning knob, but haven’t felt the need to do so, either. The radio is heavy enough that it stays put while tuning and pressing keys, which is also important. The ergonomics are good. I like how the volume, squelch, IF shift and RIT are all easily accessible single-function knobs. If I have any criticism of this radio’s ergonomics, it would simply be that several of the buttons are a bit close to the tuning knob. I have larger fingers, so while pushing the Function switch, RIT switch, keylock or turning the RIT knob, I often inadvertently move the tuning knob. But in truth, this is a fairly persnickity observation; in general I’m pleased with the panel layout and ergonomics. Like the IC-R75, the DX-R8T has a front-facing speaker–always a good thing when listening via a built-in speaker. Admittedly, the overall fidelity of the built-in speaker is mediocre at best–it lacks any bass response and sounds shallow, and unfortunately, there’s no way to change the tone from high to low. While the built-in speaker is fine for listening to the ham radio bands (in SSB or a CW mode), I would like better fidelity for the broadcast bands. This is no doubt a vestige of this radio’s ham transceiver heritage. The front display is large, with an adjustable dimmer. It is crisp and very easy to read, which I like very well. The only current shortwave tabletop competitors with the Alinco DX-R8T ($500), are the Icom IC-R75 ($600-700) and the Palstar R30A ($740 US). The Icom IC-R75 is a fine receiver and one I have recommended to many web readers in search of a multi-function tabletop. It has been on the market for years in many versions (some more successful than others), and is generally a solid performer. The Palstar R30A is also an excellent receiver, though it lacks the bells and whistles of its Japanese counterparts. People who buy a Palstar want bare-bones simplicity and performance. Since I own a Palstar R30C (the predecessor to the R30A), I used it as a point of comparison in my review of the DX-R8T. The DX-R8T is a pleasure to operate. I was able to intuit nearly all but the memory functions without looking at the owner’s manual even once. A major plus, in my opinion! The keypad is configured like that on a phone, which I like. Again, because I have large fingers, I do wish the keypad buttons were slightly bigger. Frequencies are entered in MHz, so to go to 6,925 kHz, for example, you enter “6” “.” “9” “2” “5” “ENT.” To move to 6,000 kHz, you can shortcut by entering “6” “.” “ENT.” Simple enough. I did find it helpful to use the up/down arrows to move between meter bands, otherwise I never tune with the up/down arrows. The tuning knob gets my seal of approval and scanning with it is a pleasure. Admittedly, I wish it were a little more adaptive to tuning speed (i.e., turning quickly speeds up the frequency steps) or that it could be adjusted somewhat. 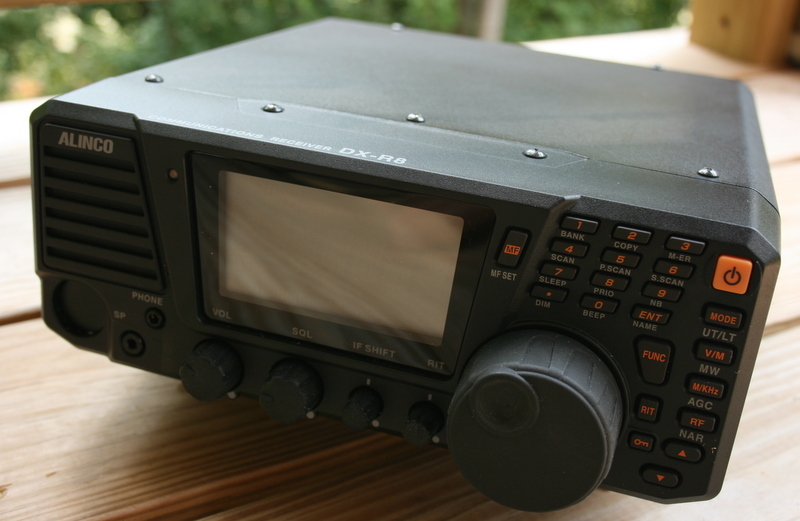 You can tell that the Alinco DX-R8T derives from amateur radio, as its tuning knob speed is perfect for finding ham radio stations. 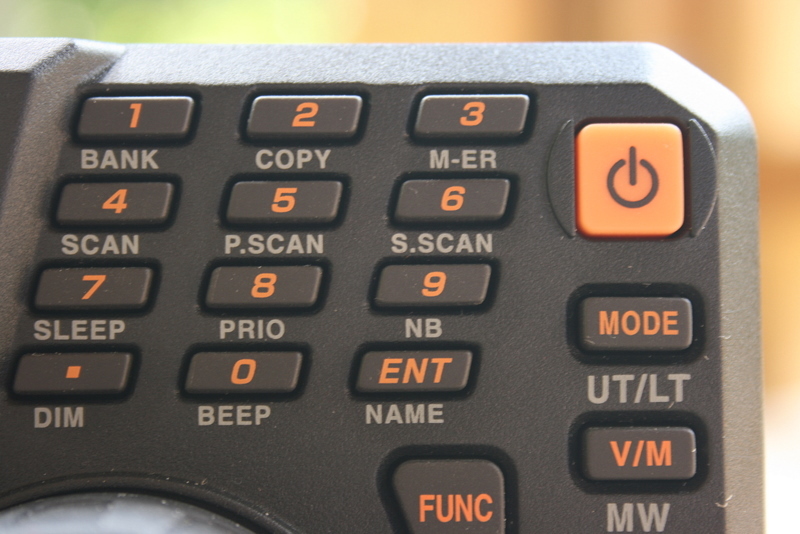 Switching between modes is simple–pressing the “Mode” button moves you between, AM, FM, CWL, CWU, LSB and USB. The volume, squelch, IF shift and RIT knobs are all well-spaced and easily accessible. The Alinco DX-R8T is a capable broadcast receiver. In my tests, it was as sensitive as my Palstar. The generous, wide 9kHz AM bandwidth means that broadcast stations come in with a great deal of fidelity. The flip side of the 9kHz bandwidth, though, is that it is less effective if there is an adjacent station–say, 5kHz away. Luckily, the DX-R8T has an IF shift knob handy so that a modest adjustment can usually eliminate adjacent interference. I found the narrow AM bandwidth a little too narrow for broadcast listening. It’s a mere 2 kHz wide and is simply too restrictive if listening to music. For voice intelligibility, the narrow filter works fairly well, using the IF shift to open it a bit. This narrow filter could be useful if trying to snag a weak DX signal, as it’s sufficiently narrow to cut out a lot of noise. Speaking of noise, the Alinco has a respectfully low noise floor. 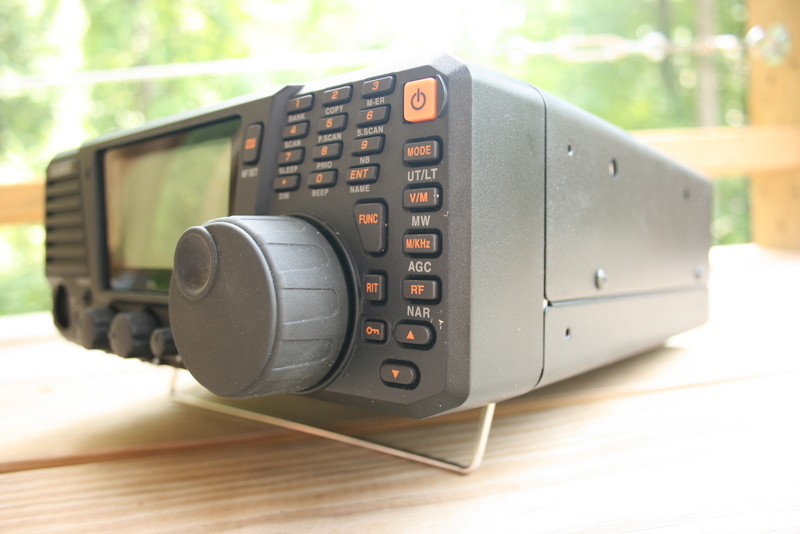 The DX-R8T has modes for upper sideband, lower sideband and even upper and lower CW (morse code/digital) sidebands. It performs rather well on the ham bands, pulling out weak SSB stations from the static. 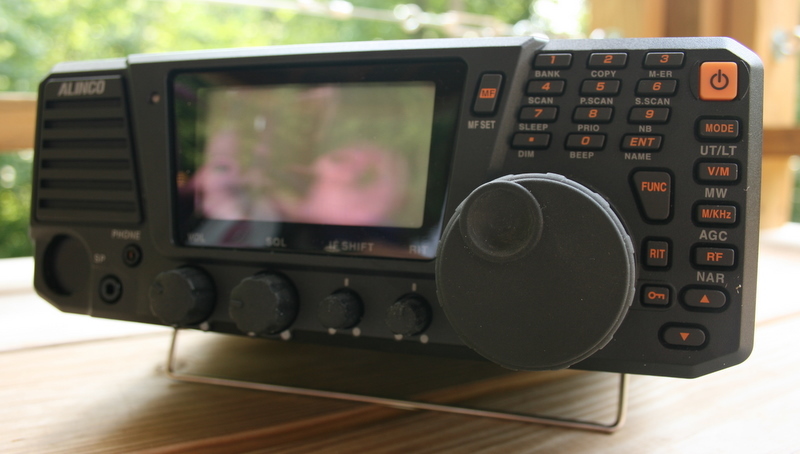 Th DX-R8T should do a formidable job listening to SSB ham radio, utility and pirate radio stations and the digital modes (like PSK31, RTTY, etc.). In the spirit of full disclosure, I have to admit that I was very skeptical of the Alinco DX-R8T before reviewing it. The price point was almost too attractive for a tabletop radio, and to offer the versatility of a detachable faceplate and control as an SDR receiver seemed too good to be true. I thought there must be a compromise somewhere. Fortunately, it seems I was wrong. The Alinco DX-R8T is, in fact, a fine receiver. I especially love the fact that it’s simple to operate. While there are relatively few new tabletops introduced to the market, there are a number of Software Defined Radios available–their performance is excellent, but the learning curve (especially for a newcomer to the hobby) can be intimidating. Plus they require a computer. With the Alinco DX-R8T, you get the best of both worlds, a simple “turn on and tune in” tabletop, plus a fully DRM ready SDR. When people write in and ask for advice on buying their first tabletop receiver, I can recommend this DX-R8T without hesitation. Though it lacks the DSP that can be purchased separately with an Icom R75, it’s as sensitive as my Palstar R30C and the 9kHz AM bandwidth lends some excellent fidelity into headphones or an external speaker. I must admit, I’m impressed with the Alinco DX-R8T. It has all of the major features I like in a tabletop radio: it’s well-built, easy to use, sensitive, versatile, and it has sufficient control options to help adjust adjacent interference and improve intelligibility. It also has a very attractive price at $499 US. It’s next-best competitor is probably the Icom R75–but neither the Icom, nor the Palstar R30A, can be used as an SDR and neither have the appropriate IF output for DRM as does the Alinco DX-R8T. In short, it’s a lot of radio for the money, excellent for those starting in the hobby. Paired with a good antenna, the Alinco DX-R8T is a bargain performer. If you’ve thought about moving from portable radios to the world of a more serious receiver, you can’t go wrong with the Alinco DX-R8T. The Alinco DX-R8T entry in our Shortwave Radio Index which contains more reviews, options for purchasing and technical specifications. This entry was posted in DRM, Reviews and tagged Alinco, Alinco DX-R8, Alinco DX-R8 Review, Alinco DX-R8E Review, Alinco DX-R8T, Alinco DX-R8T Review, DRM, DX-R8T Review on September 2, 2011 by Thomas. The IF shift does work in AM mode, however, the Murata 455G type AM bandpass filter is too wide to notice it. I replaced mine with a 455I type which is available from Mouser but listed as a 455J in their on line catalog for some reason. The IF shift works great with this filter and the overall audio degradation is not that much due to the narrower bandwidth (about 5 kHz). Just be damn careful if you try to replace it, because the surrounding surface mount parts are very tiny and fragile. You’re right. I have use IF shift with R75 for clearer audio when using 2.4kHz narrow filter, and it usually sounds better with 455kHz IF than 9 Mhz. You mention using the IF shift on AM mode broadcasts, to help with interference from another close station. Yet the manual says that IF shift is disabled for AM and FM mode. Is this true? Yes, that’s true. My If shift does not work in AM mode. Why Alinco done that is beyond me. Still toying with the Alinico vs Icom R75, both seem very good. I want it for MW . SW listening , and HF Aero. Is the AM filter as bad as I hear on all the reviews. or are icom fans nit picking ? but the R8500 is ? 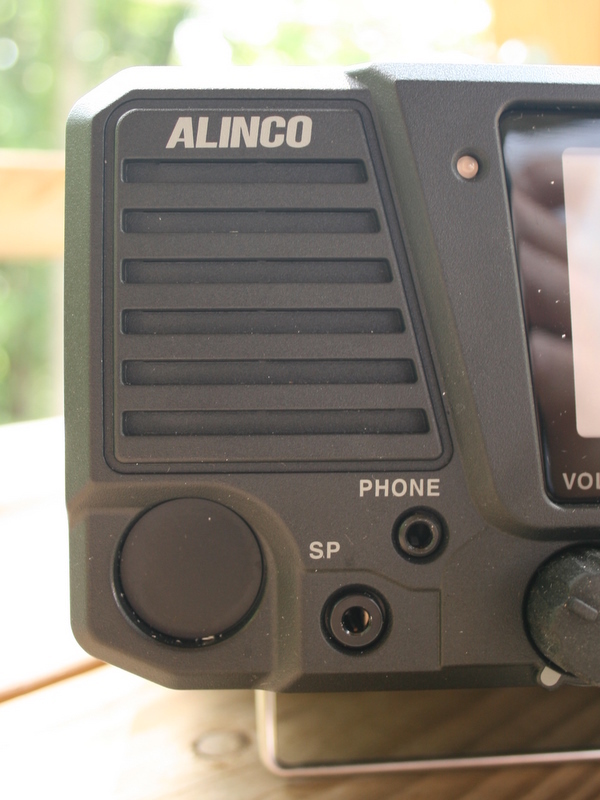 I’d like to know whether the Alinco DR-8 has lower noise floor on AM mode than the ICOM IC-R75. I have the latter, and I’m disappointed with it in this regard. I compard the R75 to a SONY ICF-2010, DEGEN DE1103 and an old Panasonic DR49/RF-4900lbs and they all performed better than R75. I like to scan with RF attenuator. I check QRN, bring it down to S1 and then look out for any pop out on the S-meter or that thump when RF amp works when using headphones. With the R75, it does not work that way. My R75 is the my best radio for SSB and other modes, but disappointed me on AM mode. And most of my DXing is on AM mode HF. I’m even checking a Kenwood TS-990s transceiver. Over the past few years I have had several Icom R75s (two with KIWA mods) and several Alinco DX-R8 receivers and I now only have the DX-R8. I found the sensitivity to be about the same on both, but the DX-R8 definitely was a quieter receiver with a slight edge on the signal-to-noise ratio over the R75. The R75 all sounded “hissy” to me. The stock AM filters in both receiver were “barn door” wide, but the dual IF shift in the R75 did allow some manipulation of this. In the DX-R8, I removed the Murata “G” type AM wide filter and replaced it with a drop fit “I” version which can found at Mouser Electronics for about $4.00. For some reason Mouser calls it a “J” filter which is an incorrect label per the catalog. The equivalent “H” filter will also work but with less effective adjustment range on the IF shift control. I do admit that the “H” has a little better audio fidelity than the “I” filter but I don’t find the latter’s audio objectionable. If you want selectivity, use the “I” type filter. CAUTION: make sure you have experience with surface mount soldering before you make the change, OR, have someone that has experience with SMD boards do it for you. It’s very easy to damage some of the tiny SMD components on the back side of the board near the filter if you are not careful. Así se capta a The Disco Palace, en modo digital DRM!!! 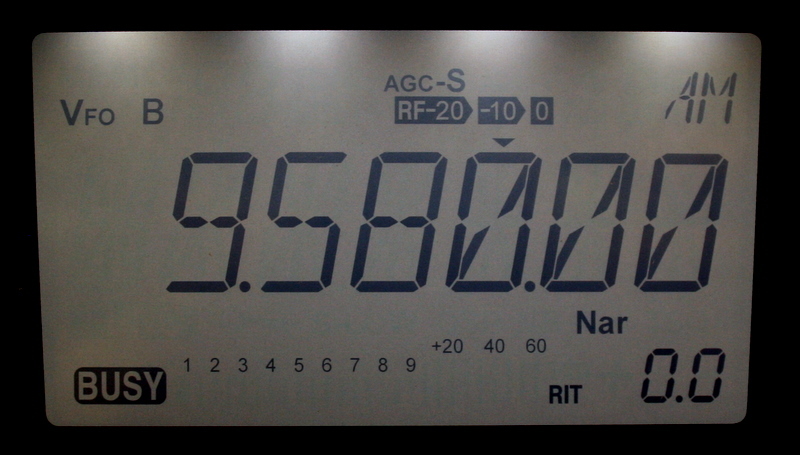 Audio corresponde al 17 Nov. 2012, de 20:28 a 20:59 por los 17875 KHz. This is an audio recording by my Alinco DX-R8T receiving DRM mode, The Disco Palace. Great Audio fidelity!!! Regards from Mexico! I fully agree with this test report! But if you don´t want to do DRM-receiving I strongly recommend to change the wide AM-Filter with a Murata CFK 455I (4KHz) or CFK 455H (6KHz) or equivalent. The Alinco DX-R8 has enough space (and drilled holes) for the Collins mechanical filters! With the 6KHz Collins my Alinco does a great job! Can you email me those details for changing the filters… sound ideal, would really lift the rx up , did you do it yourself ? whats the procedure, what do I need .. ? I contacted my supplier and they are unaware or unable to do the work .. I am in southern England uk ? What is the minimum tuning step? What is the range of the RIT, the IF Shift? IOW, How well does this receiver work for ECSS? Down to .01 kHz tuning increments. RIT is +/- 1.2 kHz. In my experience, it does an excellent job with ECSS. I will have to look on the spec sheet RE: IF shift. My tuning knob is pretty firm, but it was a very early model of the radio. I think the knob (and I rarely say this) is a little too large (especially compared with the size of the keypad). Thanks for your feedback. Thank you, I would be interested in other peoples feed back, I often think of getting the radio again but rearly put off by that wobbly axis I had on the tuning knob, I was told thay are all like that? A good few mil of play up and down, Maybe its not the case? Maybe the Eton Satilite 750 ? Templeton on Can you identify this radio from the 1992 film, ‘Sneakers’–? Andrew on Can you identify this radio from the 1992 film, ‘Sneakers’–?